View this sample cover letter for an HR generalist, or download the HR generalist cover letter template in Word. As an HR generalist, you know what it takes for a candidate to get the job—and having a solid cover letter is a big advantage. To be considered for top HR generalist jobs, your cover letter must demonstrate your skills and experience, as well as your passion for working with people. 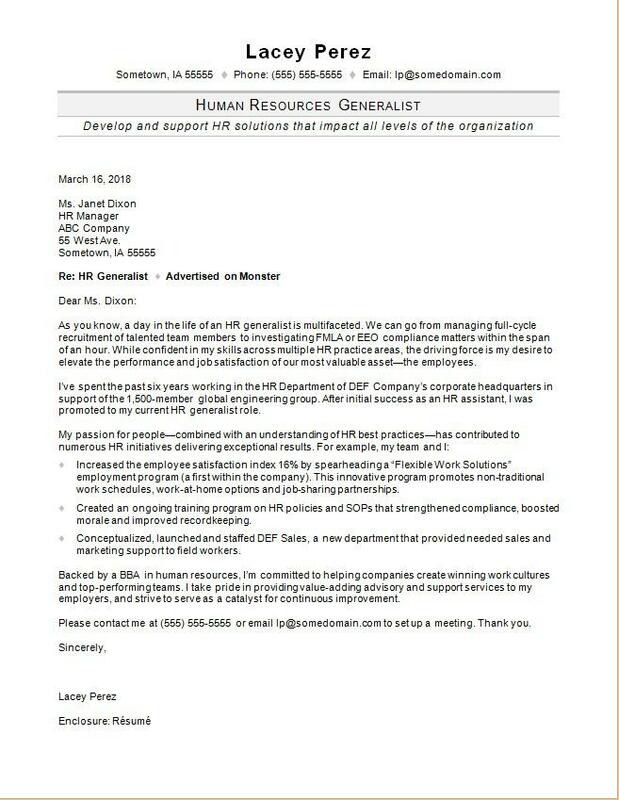 For writing tips, view this sample cover letter for an HR generalist, or download the HR generalist cover letter template in Word. Jobs for hr generalists are projected to grow by 7% (or 38,900 jobs) from 2016 through 2026, according to the Bureau of Labor Statistics (BLS). When it comes to where the most positions are located, you'll find the highest level of employment for this job in the following states: California, Texas, New York, Florida, and Pennsylvania; and in the following metropolitan areas: New York City, Washington D.C., Los Angeles, Chicago, and Atlanta. As an hr generalist, you can expect to earn a median wage of $60,350 per year, or $29.01 per hour, according to the BLS. Additionally, you can look for HR generalist jobs on Monster. As you know, a day in the life of an HR generalist is multifaceted. We can go from managing full-cycle recruitment of talented team members to investigating FMLA or EEO compliance matters within the span of an hour. While confident in my skills across multiple HR practice areas, the driving force is my desire to elevate the performance and job satisfaction of our most valuable asset—the employees. I’ve spent the past six years working in the HR Department of DEF Company’s corporate headquarters in support of the 1,500-member global engineering group. After initial success as an HR assistant, I was promoted to my current HR generalist role. Increased the employee satisfaction index 16% by spearheading a “Flexible Work Solutions” employment program (a first within the company). This innovative program promotes non-traditional work schedules, work-at-home options and job-sharing partnerships. Created an ongoing training program on HR policies and SOPs that strengthened compliance, boosted morale and improved recordkeeping. Conceptualized, launched and staffed DEF Sales, a new department that provided needed sales and marketing support to field workers. Backed by a BBA in human resources, I’m committed to helping companies create winning work cultures and top-performing teams. I take pride in providing value-adding advisory and support services to my employers, and strive to serve as a catalyst for continuous improvement. Please contact me at (555) 555-5555 or email lp@somedomain.com to set up a meeting. Thank you. A cover letter is a great way to establish a connection, but a hiring manager is also going to carefully examine your resume before determining whether or not to call you in for an interview. Need some help making sure yours is up to the task? Get a free resume evaluation today from the experts at Monster's Resume Writing Service. You'll get detailed feedback in two business days, including a review of your resume's appearance and content, and a prediction of a recruiter's first impression. Consider it a resource to help your job search feel more human.